"In my view, you must either do away with ornament - or make ornament the essence. It's not something you add. It's not icing on a cake. It's everything - or it's nothing." "I create the painting in my mind, color gives me inspiration, passion is very important, so I am looking for radiance, with all my soul." "Your soul is like a landscape." "[Rococo is] a lyrical conception of humanity, a response to all that is transitory and fugacious, a calligraphy of farewell." 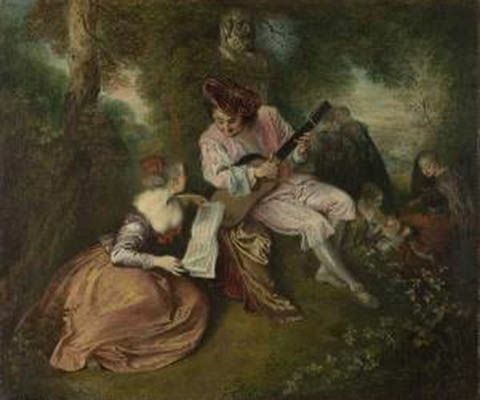 "Watteau restores to charm its original, medieval meaning, charm as the enchantment of a magic spell." 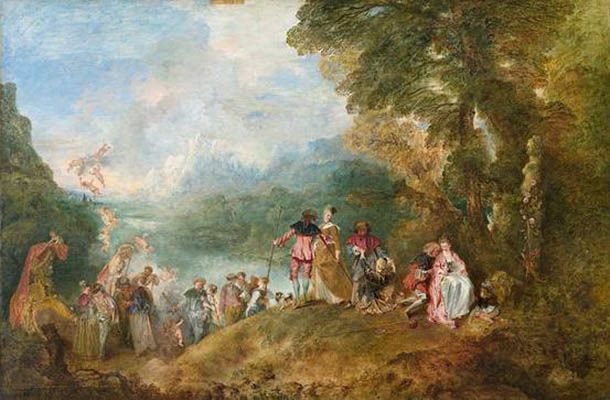 Born in Valenciennes, a city in northeast France that before 1678 had been part of Flanders, Jean-Antoine Watteau would always somewhat identify as a Flamand. His father, a master tiler, was a violent man and perhaps this had a formative effect on his son. In any case, Watteau never made any references to his family in his work. We do know that from a very early age he showed a talent for drawing, and it is telling that some of his childhood sketches are believed to be of travelling salesmen or tonic-selling quacks. Certainly his whole life he remained interested in performers, mendicants, and people on the fringes of society. 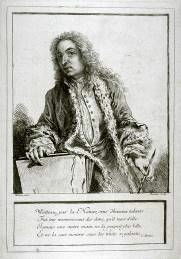 Watteau may have had an elder brother, which may explain why his father was not averse to Watteau studying art rather than the family profession. Though it had been an important cultural center of the Spanish Netherlands, by 1700 Valenciennes, was a French outpost, and there were few skilled local artists, making it difficult for Watteau to start training in the field. The city's best-known painter was Jacques-Albert Gérin, and he is generally believed to have been Watteau's first teacher; however, Gérin's work, such as it survives, is firmly rooted in the Baroque, but even Watteau's earliest work shows no trace of Baroque influence. 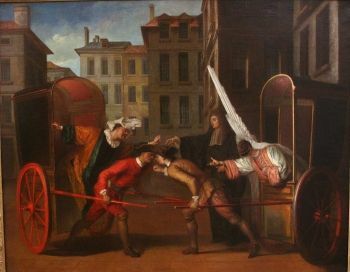 In 1702, when Watteau left Valenciennes for Paris to begin his real training, France was a year into the War of Spanish Succession. Louis XIV's absolutist rule was becoming increasingly eclipsed, and industry, trade, science and culture that had flourished under the Sun King were in decline. By 1701, the greatest painters of that generation, including Charles Lebrun and Pierre Mignard, were dead, and the only remaining profitable genre was portraiture, which had never been Watteau's forte. He was a reserved young man, not formally educated or socially connected, but he was highly intelligent, curious, observant, and he had taste. He loved music, opera and the ballet, was an enthusiastic and catholic reader, and importantly, he had no intention of returning to Valenciennes. Instead, he found studio lodgings on the Pont Notre-Dame, where he supported himself by painting copies after old masters for Edmé-François Gersaint, an art dealer who specialised in Dutch and Flemish painting, schools that inspired Watteau throughout his career. Around 1704, Watteau began training with Claude Gillot, who would prove integral to the development of his style and subject matter. Gillot, an innovative designer, with a brilliant sense of line, was more a draughtsman than a painter. He was also something of an outsider, socially maladroit, and drawn to eccentric, even weird motifs; however, his sinuous arabesque designs and especially his theatrical subjects captivated Watteau. 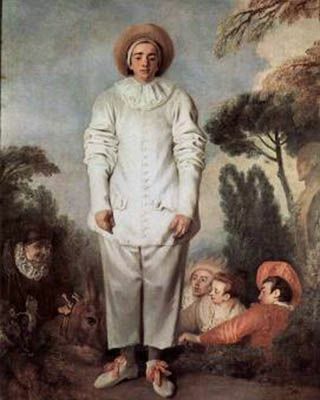 In fact, Gillot introduced Watteau to the Comédie française and the Commedia dell'arte, the French and Italian versions of popular comedic theater that were largely improvised and used familiar stock characters. Watteau's Commedia dell'arte subjects are similar to those of Gillot, with their frontal, almost music-hall compositions. Indeed, these early pictures feature earthy Flemish tonalities and stocky figures that only hint at the level of nuance and sophistication Watteau would later achieve. 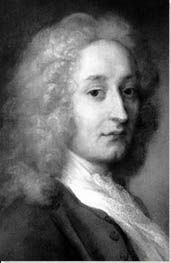 During the nearly four years he spent with Gillot, Watteau also learned the skills and techniques of decorative panel painting, which had become a popular, economic alternative to elaborately painted and stuccoed designs. 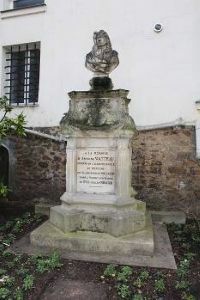 Gillot had made a name for himself with his acrobatic sense of line, delicate colorism, and witty motifs, but he soon saw his pupil surpass him, and the two men parted somewhat bitterly around 1708. 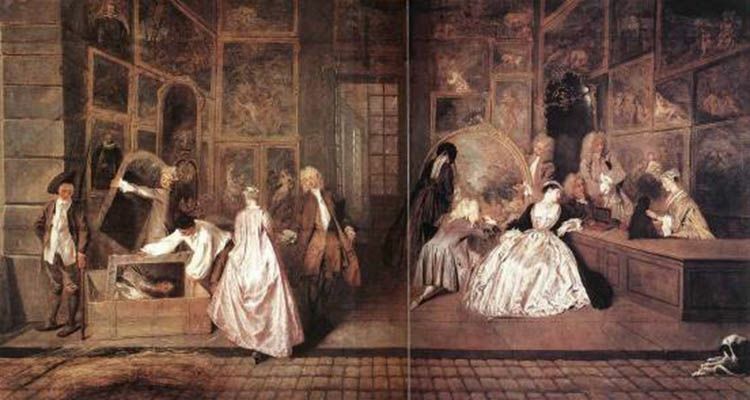 Watteau then entered the studio of Claude Audran III, one of the king's leading painters and decorators. To say that Audran opened doors for Watteau is an understatement; his support, connections, and guidance were integral to the young artist's career. 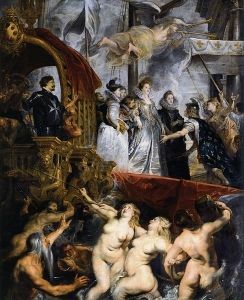 In 1704, Audran was appointed conservator of the Palais du Luxembourg where Rubens' cycle of canvases devoted to Marie de' Medici were installed. Audran gave Watteau frequent access to study these works, and the Flemish master's roiling color and energy profoundly informed his imagination. Equally, as Watteau progressed as a decorative painter, he learned to work quickly, developing a seemingly spontaneous sense of line and motif, which, in his later easel paintings, evolved into his distinctive flickering brushwork. It is not certain for how long Watteau continued to produce decorative paintings after he left Audran's studio in 1709. Art historian Helmut Börsch Supan dates a large series of chinoiserie designs for the château of La Muette (now gone) to between 1708 and 1710. In 1709, Watteau is believed to have sold one of his paintings to fund a trip to Valenciennes. Now twenty-five, in 1709, Watteau won second prize in the Prix de Rome competition at the Académie Royale de Peinture et de Sculpture. But like all ambitious young artists of the time, he wanted to study in Italy, and it was perhaps his disappointment at missing out on first prize that compelled him to return home. Accounts of how he spent his year in Valenciennes are patchy, but art historian Michael Levey notes that he met and befriended Antoine de la Roque, future director of the important literary magazine Mercure de France. 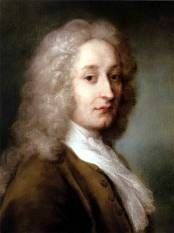 During his stay, he also reconciled with Jean-Baptiste Pater, who had earlier been his student and whom Watteau had treated very badly. When he returned to Paris in 1712, he brought Pater with him. That year, Watteau returned to the Académie where he was provisionally accepted. He was invited to submit a painting as his morceau, his reception piece. After finally completing the work in 1717, he became a full Academician with his painting The Pilgrimage to the Island of Cythera. He was, in fact, admitted as a painter of fêtes galantes, a new genre, which the Académie created especially for him. Watteau was now a successful artist, whose patrons and supporters included Count Carl Gustaf Tessin and the Duc d'Arenburg. He also became acquainted with Charles de la Fosse, who introduced him to Pierre Crozat, a fabulously wealthy banker and collector, who made his huge collection of Old Master drawings available to Watteau for his studies. Watteau's career was meteoric in both his popularity and his artistic development. In barely fifteen years, he was remarkably productive, and his extant œuvre includes about 200 oils, many of which are also preserved in engravings and copies; very few original decorative paintings exist, nearly all of which are now known from engravings; and while hundreds of drawings remain, there is believed to have been thousands. By 1719, Watteau, who had never been in strong health, was seriously ill with tuberculosis, although it is not clear when he first became infected. Some biographies suggest he became infected in London, when he travelled there that year to paint two pictures for Richard Mead, a physician and collector. Others contend, he travelled to London specifically to seek treatment from Mead. By 1720, he had returned to Paris, where he lived for several months with Gersaint, the art dealer he worked for early in his career. Ultimately, he had hoped to recover enough to return to Valenciennes, perhaps sensing he would soon die. 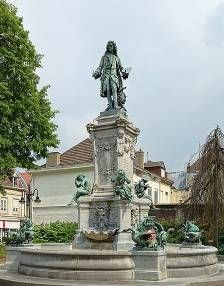 Unfortunately, he proved too ill for the journey and in the spring of 1721, his friend Paul Maurice (Abbé) Haranger arranged for him to stay with a Monsieur Le Febvre at Nogent-sur-Marne, a village east of Paris. 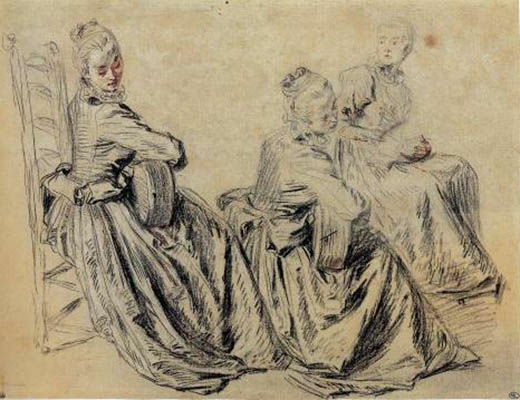 There, Watteau continued to work. Not only did he paint his last work, a Christ on the Cross for the village church (now lost), but he also left several fêtes galantes and Commedia dell'arte subjects in various states of completion. Despite his industry, however, he never regained the strength to go home, and he died that October in the house of Le Febvre. Almost immediately following Watteau's death in 1721, his prestigious friends published volumes of prints after his work, and several biographies, many of which, while true tributes, are unfortunately patchy on hard facts. Ironically, Walter Pater's deliberately fictional essay "A Prince of Crown Painters" is one of the more satisfying tributes to the artist, but perhaps Watteau's flesh-and-blood elusiveness only intensifies the effect his timeless, painted daydreams continue to exercise even today. Certainly, he remains one of the most paradoxical painters in French art. A deeply sensual artist, he never married. He had no known lovers, yet his scenes of love - even at their most theatrical - are subtle and insightful. In Watteau's world, love is a true utopia: simultaneously the best place to be, and the place that cannot be. Equally, while he was notoriously moody and asocial, he inspired such devoted friendship that he rarely kept a fixed address. Instead, friends and collectors arranged studio spaces for him around Paris, as well as free room and board at their lavish hôtels and châteaux. Perhaps they saw such patronage as a fair exchange for the privilege of escaping into his paintings. Watteau's mastery of color and texture, and his distinct visual language (effectively an iconography of the human heart) created images that captured both the finest and the most fallible aspects of humanity. His work truly connects the drama and excess of the late Baroque with the discrete humanism of the Enlightenment. These two panels are a rare example of Jean-Antoine Watteau's early career as a decorative painter, and they are all that remain of a series of eight commissioned by the Marquis de Nointel. The other six panels, now lost, are known from engravings, and share similar light-hearted or sensual subjects (e.g. harvesting grapes, drinking, dancing, and other assorted follies) suggesting that the series may have decorated the dining room or breakfast room of Nointel's home. 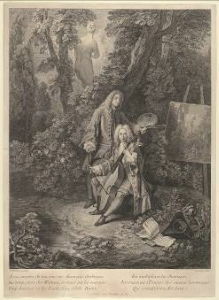 L'Enjôleur (the cajoler) shows an elegant young woman and a swain standing upon a platform, the curved and cut edges of which alternately advance and recede to accord with elements of the composition. The figures are surrounded by an intricate, yet airy configuration of garlands, ribbons, arabesques, and various foliate motifs, the whole crowned with a basket of flowers. Below the platform dangles a biniou, a traditional Breton bagpipe. In Le Faune, Watteau placed a pedestalled statue of Bacchus, flanked by a curious ram and a gilded ewer, upon an elegant semi-circular console. This console is supported by delicate volutes and surmounted by slender, nearly invisible foliate columns, creating an overall impression of suspension and weightlessness. The whole group is framed by a three-arched trellis topped on the first and third arches with flower baskets. Below the console, two large birds perch on palmettes. Influenced by the work of his earlier master Claude Audran III (who possibly also recommended Watteau to the Marquis), the panels illustrate how Watteau embraced the exoticism and inventiveness of Rococo taste. Drawing from his teachers' styles and techniques, Watteau painted his symmetrical vignettes on white grounds, which set off the elegant play of line. While his mature work featured sparkling satins, bosky shadows, and complex tonalities, Watteau's decorative designs focused on line, rhythm, balance and correspondence of motifs, all of which he painted here in muted gold, pink, cornflower blue, and sage green. First published on 21 Jan 2019. Updated and modified regularly.